The Big Quiet: Bostonians will be the first non-New Yorkers to try out this meditation event. The Big Quiet will make its way to Fenway on Monday as part of the city’s wellness week, and you’ll be able to join 400 people in a sound bath meditation featuring practitioners, instrumentalists, and violins. Stick around for a reception featuring Kind snacks. $20, 6 p.m.-9 p.m., Fenway Park, 4 Yawkey Way, Boston, facebook.com. Tranquil Tuesday at Sky Lounge: Head into your workday at peace and with an open mind by attending a meditation session on the rooftop of Yotel. Andy Kelley will lead you through a 30 minute guided meditation before you head off to start the rest of your day. $15, 7 a.m.-7:30 a.m., Sky Lounge Rooftop + Terrace, 65 Seaport Blvd., Boston, eventbrite.com. Get Fit in the Square: Test your running skills at the Precision Running Lab at Equinox for free. The class, which is interval-based and in a room enriched by an O2 vaporizer, beats drudging along on a regular treadmill by yourself. Afterwards, enjoy a post-run stretch and bites from Oath Pizza. Free, 4 p.m.-5 p.m., Chestnut Hill Square, 200 Boylston St., Newton, eventbrite.com. Brookline Run Club: All ability levels are welcome in this run group that meets in Brookline for a run around Chestnut Hill Reservoir and through the neighborhood. As a member, you’ll become eligible for a special discount, members-only gear, and other promotions. Free, 6:30 p.m.-7:30 p.m., Marathon Sports, 1638 Beacon St., Brookline, eventbrite.com. Yoga on the Esplanade: Hit your mat for one more outdoor yoga class on the Esplanade this week with Healthworks. The class will last an hour. Free, 6 p.m.-7 p.m., Fiedler Field on the Esplanade, Boston, eventbrite.com. NamaSTRONG x Energize: Bid the last days of summer farewell from the best spot in the city—a rooftop. Meet Mooch and Mel of MOVE at Energize in the Back Bay for a yoga and HIIT workout flow. Free, 6:30 p.m.-8 p.m., Energize, 265 Mass. Ave., Boston, eventbrite.com. Kick it By Eliza x New Balance: Kick it at Boston Landing with a free Kick it By Eliza class at the New Balance Flagship store. Afterwards, stick around for snacks from Kohi Coffee, Rail Stop Restaurant and Bar, Hint, Kind, and Soulfu3l. Participants will also receive 20 percent off New Balance purchases. Free, 6 p.m.-8 p.m., New Balance Global Flagship Store, Boston Landing, 140 Guest St., Boston, eventbrite.com. Essential Oils Workshop: Ever wonder what the benefits of essential oils are? Or what happens when you use lavender or peppermint extracts in your home? Now’s your chance. Join this free workshop to understand the ins and outs of essential oils and how to use them properly to reap their benefits. Free, 7:30 p.m.-8:30 p.m., The Point EB, 20 Orleans St., Boston, thepointeb.com. 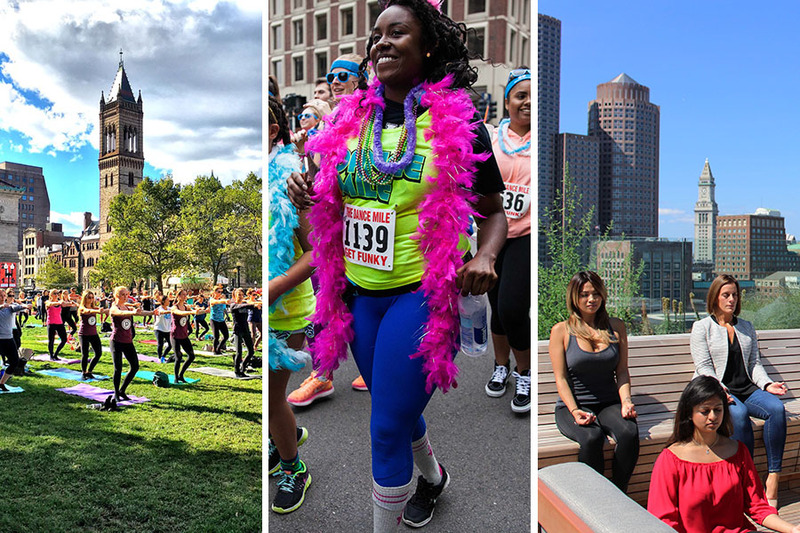 Boston Social Fitness Festival: Run, don’t walk, to City Hall Plaza for an entire day of free fitness classes and activities ranging from bootcamp to yoga and even outdoor spinning and a dance mile. Everything is free, but it is highly recommended that you sign up. Free, 7 a.m.-3 p.m., 1 City Hall Square, Boston, bostonsocialfitness.com. Rock the Dock 5K: Hit the ground running this Saturday morning to benefit “In the Same Boat,” a free program at Community Rowing for disabled and able-bodies military veterans readjusting to civilian life. The route will be a shaded, scenic loop along the river. $35, 11:30 a.m.-4:30 p.m., Community Rowing Inc., 20 Nonantum Rd., Brighton, racewire.com. Pure Barre at Copley Square: Join Pure Barre for a one-hour barre class outside in Copley Square complete with all the glute pulses and inner-thigh holds you’ll ever need. Each participant will leave with a Spiritual Gangster swag bag and juice from 6 AM Health. $15, 2 p.m.-3 p.m., Copley Square, 206 Clarendon St., Boston, purebarre.com. Hub on Wheels: A part of the Wellness Week initiative, this citywide ride has two route options: a downtown ride and an Emerald Necklace ride. Take to the city on two wheels and enjoy the sights. $55, 6:45 a.m.-2 p.m., City Hall Plaza, Boston, hubonwheels.com. Sweat, Barre, Stretch at SoWa: Enjoy a Sunday at SoWa, complete with a workout. This barre class blends cardio and yoga exercises to get your heart rate up before winding down with 15 minutes of stretching. Please bring a mat. Free, 10 a.m.-11 a.m., SoWa Power Station, 540 Harrison Ave., Boston, facebook.com.